Join a local community of gamers who play an assorted selection of tabletop war games here at the Wasco County Public Library. Tabletop Wargames are an offshoot of Roleplaying Games, but the players control a collection of miniatures that represent individual units doing specific tasks on the "battlefield" (tabletop). These games are a great way to learn forward thinking, math, strategic planning, creativity, and narrative storytelling. Games played include fantasy games set in a Tolkien like universe, historical games set in World War II, and futuristic games set in sci-fi universes where anything is possible. No miniatures are needed to play, we have sample armies available and a great selection of players who are eager to teach new people. Currently we offer two days a month where community members can participate and learn about gaming. We are excited to announce that we just received sponsorship from the game publisher Games Workshop to start a Teen Warhammer Club for ages 12 - 18. 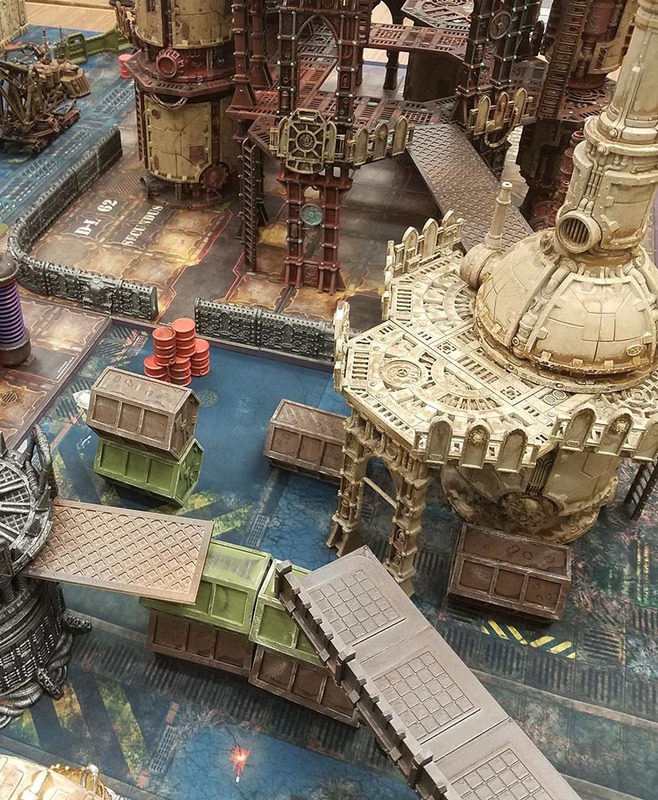 This club has a dedicated teen volunteer organizer who works alongside library staff and adult volunteers to introduce the Warhammer gaming universe to area youth. Teen Warhammer Club meets the second Saturday of every month in the Teen Space at 11 am and runs until closing at 6:00 pm. Refreshments will be provided. In addition to our Teen Warhammer Club we also have all ages gaming on the last Sunday of every month that starts at 12:00 pm and usually runs until around 5:00 pm. The club meets in The Dalles Library Meeting Room, and we provide refreshments for participants. In addition to these two game days we meet once a month to teach Miniature Painting at one of our local partner's venue. Please watch the images and announcements on this page for updates and information. This club is made possible by the generous support from the following organizations: Games Workshop, Oregon Trail Games of The Dalles Oregon, the Ordo Faniticus Gaming Club of Portland Oregon, and personal contributions from numerous Wasco County community members.